How fun to see all the color recipes in a big pile like that! Looks like you have been busy.I am so glad that you are enjoying the membership and are getting great value from it. That means a lot to me! I do almost the same thing as you except I have a "recipe" book where I put color chips in with my recipe and code them with a number. The colors I like to use the most I make a separate larger chip with my recipe # on the back so I can play around with them as well to mix and match my colors. I just hopped into your site for the first time. I'm so glad I did today to see all your color samples and how your saving them. I have been trying to learn polymer clay on my own - I just signed up for Cindy Lietz monthly newletter thanks to you. I'll be back to visit ! Yes you are right everyone does seem to be thinking of colour. I have never really thought about it much before and just picked up the colours I like, never really bothered to mix them. "The world is a carousel of colors..." I mixed some clay today using Maggie Maggio's system. I like this method best. I can 'somewhat' control the amount of clay that gets mixed. I love Cindy Lietz's color palettes, but sometimes the parts require you to mix large amounts of clay. Just today I worked on organizing my data files. I decided to save all the recipes together with a picture of the palette. 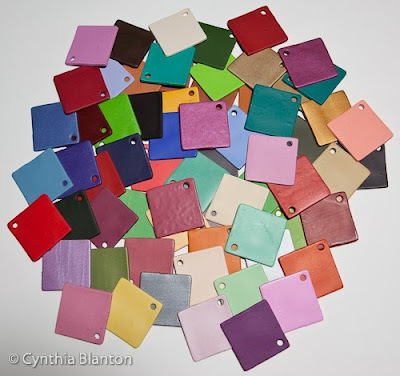 I went back through Cindy's blog and found the pictures of the color palettes. Then I renamed all the color recipes so that they would be with the palette image. I think now when I look through the computer for a color the picture will be close by. I am going to post a picture on my blog, if you like to take a peek.